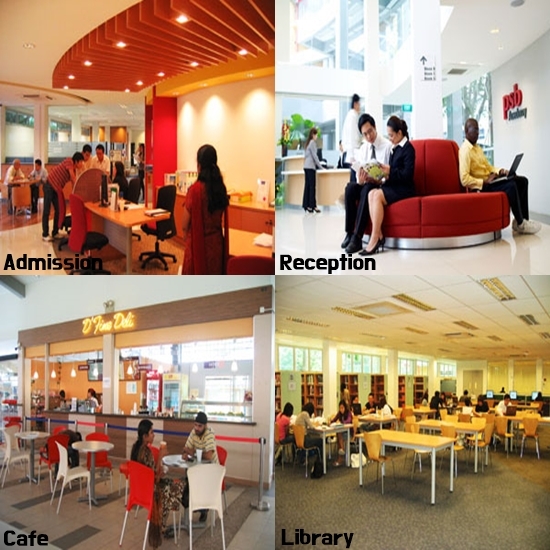 PSB academy is a prestigious private university located in Singapore. Dispatching to this university will start from the first semester in 2017. With 50 years history and tradition, PSB academy has received the highest grade for four straight years from Singapore’s private education committee, Edu-Trust. PSB academy is a recognized university that has been ranked the top in various investigations such as in Asia One People’s Choice Award, Singapore Experience Award and Job Central Award. PSB academy is located near Tiong Baru station, so accessibility to the university is good. Shopping malls, restaurants and stores are located near PSB academy, so people can enjoy convenient lives there. The first thing to be careful about when applying for PSB academy is that there are many differences between exchange students and visiting students at the beginning of the semester in the curriculum, English skills, and tuition. Exchange students have to take regular courses called Diploma, which is equivalent to the first and second grade level of Korean universities. Exchange students can only take Business Administration, Accounting & Finance, and Hotel Management. The semester starts from the middle of January, and exchange students can take 12 credits by selecting 4 subjects out of 5. In the case of visiting students, they have to take regular courses called Degree, which is equivalent to the second to fourth grade level of Korean universities. Visiting students can take affiliated classes of Business Administration (Advertising & Business, Advertising & Marketing, Business & Marketing, Accounting & Finance, Management & Finance), Electrical & Electronics Engineering and Computer Engineering. They are required to take 3 fixed subjects (9 credits) and the semester starts in March. Student whose average GPA is 2.5 or above are eligible, but the required English score for exchange student and visiting student, are very different. For an exchange student, the language requirement is greater than 5.5 in IELTS (Writing 4.5 or more) or TOEFL IBT score over 70 points (Writing 16 points or more). Visiting students need an IELT score over 6 points (more than 5.5 points in all area) or TOEFL IBT score higher than 80 points (higher than 17 points in Listening, 18 points in Reading, 20 points in Speaking, and 17 points in Writing). You have to keep in mind that other universities do not approve the mock TOEIC and TOEFL test scores done at Gachon University. Also, all exchange student school expenses are exempted but visiting student have to pay their own school expenses. Facilities and programs for students on campus are well equipped. They provide lecture halls with state-of-the-art educational facilities as well as an indoor gymnasium and a place for students to do project work and have group discussions. All students are free to use these facilities. Furthermore, PSB academy is running a student council, student association of international students, sport clubs, students’ clubs and connect + programs. Such activities are aimed to enrich the campus lives of students. Connect + program provides opportunities for students to interact with each other and build positive memories through games, art and culture exchange. Connect +P (People) and Connect +C (Culture) program are fun ways to make new friends and experience cultural diversity on campus. The Connect +G (Connecting Globally) program allows students to learn the concept of networking for career development in a globally connected world. PSB academy gives a lot of support for the welfare of international students. There is a counseling center within the school where international students can receive free counseling with professional counseling teachers. Also, there is a medical aid-center that provides necessary help for sick students and it also helps them to contact their families. In addition all students at PSB academy receive a PSB academy card that they can use for discounts at shopping malls around the school as well as other regions and transportation. There is no dormitory on campus at PSB academy. Therefore there is some difficulty that international students have to stay at an outdoor dormitory or rent their own accommodations. You don’t have to worry about it though because there is a Korean office to help solve accommodation problems and to help with dispatching preparation through consultation. Why don’t you take more interest and take the challenge to apply as an exchange student or visiting student for PSB academy. It has excellent educational curriculum and facilities, and puts a lot of effort into the welfare of students?